Just how deadly is North Korea’s new anti-ship missile? North Korea tested an anti-ship missile on Sunday off its eastern coast. Prashanth covered the test in some detail on these pages, noting that the test “may signal Pyongyang’s growing capabilities.” This is certainly the case with almost any new asset North Korea adds to its aging repertoire of military assets. 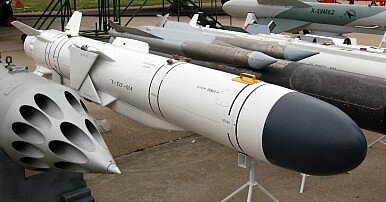 As several commentators and experts have noted, its interesting that the missile tested appears to be Russia’s Zvezda Kh-35 subsonic anti-ship missile (whimsically nicknamed the “Harpoonski” for its analogous appearance and function to the McDonnell Douglas Harpoon). Working with the assumption that this rocket is indeed a base-spec Kh-35 or a Kh-35 variant (currently reported as the KN-09), how specifically can North Korea leverage its capabilities against Seoul, if at all? Is this missile indeed “cutting edge” as the Rodong Sinmun would have us believe? First things first: what are the capabilities of the Kh-35? Designed for air-to-surface and surface-to-surface use (only the latter use case concerns North Korea), the Kh-35 is designed to take out vessels up to 5000 tonnes. Naturally, given the missile’s sub-sonic spec and relatively primitive homing capabilities, any ships with sophisticated contemporary missile defense systems would likely be able to defend themselves against the missile. This certainly include South Korea’s advanced Aegis-equipped destroyers. Other relevant points on the Kh-35’s spec sheet include a range of roughly 130 km with a warhead weight of 145 kg. The missile is equipped with active radar homing and can travel at a maximum speed of 300 m/s (Mach 0.8). Based on South Korean estimates from when the Kh-35-esque missile was first shown in a North Korean propaganda film last summer, Pyongyang may have made some changes to the Russian design. Without addressing the question of where exactly Pyongyang managed to acquire these missiles (one possibility is a direct sale from Russia), North Korea has been known to modify existing Russian missile designs for its own purposes. As Jeffrey Lewis has noted over at Arms Control Wonk in the past, one North Korean missile test involved a modified extended-range SS-21 Tochka 600 mm missile. The North Korean Kh-35 could similarly have important modifications. The South Korean defense ministry reported that the missiles flew to a safe sea landing 125 miles in a northeasterly direction off the North Korean coast, putting the total range at roughly 200 km, a 53 percent increase over the base Kh-35 design. (This estimate is naturally ignorant of warhead weight — a key variable in gauging whether North Korea made any range modifications). Now to the key question: is this rocket for the purposes of muscle-flexing and protesting U.S.-South Korea military exercises, or can the North effectively include this against South Korean surface combat assets? Without overestimating North Korea’s capabilities and intentions, I think it’s worth emphasizing that these missiles could do serious damage to older South Korean vessels, many of which are still used by the ROK Navy to patrol the Northern Limit Line (NLL). The NLL, the de facto maritime extension of the border between the two Koreas, is constantly the venue of exchanges of fire between North and South Korean vessels. With the Kh-35, North Korea could easily sink a 1,200 tonne Pohang-class corvette. Each of these corvettes carries a crew of roughly 90 and such an incident would echo 2010’s torpedo sinking of the Pohang-class ROKN Cheonan — one of the more devastating North Korean attacks against South Korea since the Korean War armistice. Still, before we get too alarmist, it’s important to recall that this is all based on open source analysis and speculative lines of inquiry — notoriously unreliable methods for assessing North Korean capabilities. If North Korea’s new rocket meets the minimum effectiveness and specifications of the Russian “Harpoonski,” the above assumptions would be largely correct. I’m sure South Korean defense planners will certainly assume so, lest they underestimate North Korean capabilities leading to a deadly skirmish. As other observers have noted, the big question, apart from the sheer capabilities of this missile, is the rate at which North Korea will be able to successfully integrate it into its existing military structure.